The smell of fresh roasted peanuts and tree nuts greets you as soon as you walk inside City Peanut Shop . The store near 8th and Bannock has provided a taste of Boise for close to a decade. But when City Peanut Shop first opened in 2009, Downtown Boise wasn't so busy. "It was right in the heart of the recession. This street was almost empty. It just turned out the Chocolat Bar had moved around the corner next to me right when I was signing my lease, so it worked out perfectly. We kind of started a food movement here on Bannock Street," said Dan Balluff, City Peanut Shop owner. Balluff left behind his career in the tech industry in exchange for something more nostalgic. As a kid, he grew up in Michigan going to a hometown peanut shop with his dad. "I just fell in love with and re-fell in love with downtown. I've been here a long time, and decided that I should try and make it better and create something. My father, who's 90 years old now, he'd say, 'you should open a peanut shop. Everybody's happy in a peanut shop. Everybody loves a peanut shop.' So, I'm not a culinary person, but I thought about it, started doing some research, and about four months later I was open," Balluff said. Balluff found a chef to help him get the kitchen set up and create the first recipes. Now? From peanuts to cashews, caramel corn, peanut brittle, and almond butter, there's a lot to try. "A lot of the recipes just kind of came to me because I wasn't limited by any culinary training. I was able to just say, "well what would it be like if I threw some maple syrup on there and threw some cayenne in and put it on pecans?' And they turned out to be delicious," Balluff explained. 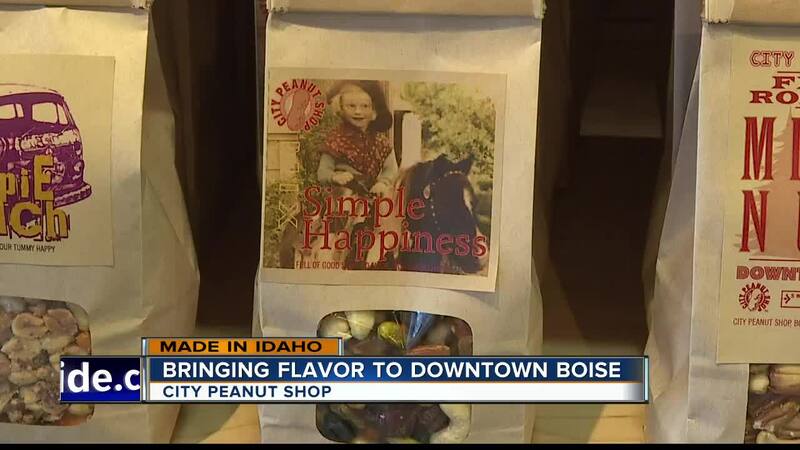 City Peanut Shop works closely with other Idaho businesses too. You might eat their hazelnuts on salads at Boise restaurants, or find a nut mix sitting on your table at a brewery. Look at any of the product labels, and you'll see many local ingredients included. "I like to think we helped create a culture of collaboration between small businesses in Boise," Balluff said. "My legacy in life is I try to make things better when I get involved. I do my best to try to make this a warm, livable city for everybody--and friendly. So we work really hard to be a good citizen downtown." You can find City Peanut Shop treats in local stores all over Boise, as well as the shop itself at 803 W. Bannock Street. Balluff says First Thursdays at the shop are a lot of fun. They'll also have a booth at the Capital City Public Market when it opens Saturday, April 13.